Visit the Gulag Night page for more; come listen, call in for questions. (Link). 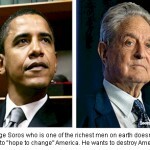 George Soros funds the Center for American Progress, which has been characterized as Barack Obama’s Ideas Factory. John Podesta, its head, led the transition team when Barack Obama became President. The Center has also become a hiring hall for the Obama team, filling its positions with former employees (among these was controversial Van Jones — who now is back at the Center). Apparently, George Soros and his Center are upset that the American people placed a roadblock in their plans when we rose up and painted the nation red. The Center now is providing a blueprint of ways Barack Obama can do an end run around the people’s will by resorting to methods that will strike many of us as being improper-to say the least. Relying on executive orders, interpretation of regulations, rule -making and the like they are collectively a recipe for even more power being assumed by President Obama. They need to keep their fellow global Marxists patiently working (especially the militant and salivating pillagers of the proletariat “ruckus”). They need to make a show of separation from Obama, Pelosi, etc. — to make it appear that They, the Communists are not calling the shots. They create a “plausible deniability” of their conspiracy and by comparison, portray Obama, Pelosi, and the “progressives” as not being communists.